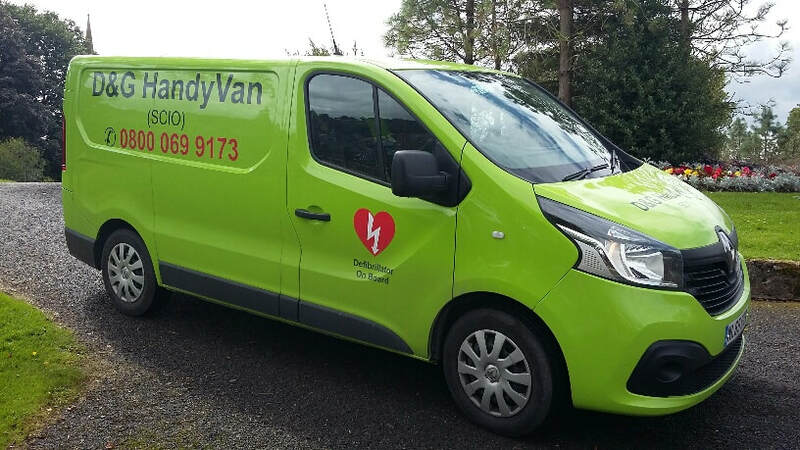 D&G HandyVan (SCIO) delivers the Small Repair & Home Support Service on behalf of Dumfries & Galloway Health & Social Care Integration. a victim of domestic abuse (no barrier on age). This entitles you to two 2 hourly visits in one year. THE SERVICE IS NOT MEANS TESTED. A home owning client or tenant of a private landlord (any age) with a disability would fit the criteria. A home owning client or tenant of a private landlord (any age) with learning difficulties would fit the criteria and would be eligible for assistance. WHAT KIND OF ASSISTANCE DO WE GIVE? ﻿Home Security We fit a range of security products from smoke alarms, CO detectors (for clients who have gas or solid fuel), door chains (wooden doors) or safe-T Bars (double glazed doors), spy holes, door locks, window locks etc. Small Repairs We can put up shelves and also do small plumbing jobs such as fix leaking taps. Falls Prevention (internal and external) Examples of this can be putting up curtain rails, tacking down carpets, fitting grab rails as well as gutter cleaning etc..
Minor Adaptions This could be simply fitting socket safes, memo minders, draught proofing or fitting a door bell. Gutter Cleaning - (Chargeable £20 per household) for one or two storey homes when weather permits. Materials such as curtain rails etc, under Falls Prevention, are supplied by the client, as well as draught proofing, door bells etc. Completely free of charge we fit socket safes (supplied by the Community Mental Health Team) and memo minders supplied through Telecare. In good partnership working with the Food Train, D&G HandyVan (SCIO) has, in the past, secured assistance from some of their volunteers. We are most appreciative of this link and the generosity of volunteers’ time. See our Volunteering page if you think you can help. Key Safes are another safety feature that we are often asked to fit to homes. This device can give peace of mind to families who have, for example, an elderly relative to whom carers require access to the home. By fitting a Key Safe at an external door, carers can key in a pre-set code to access the key behind and enter the home. Once finished, the door is locked and the key returned to the keysafe. Click here to learn how to open & close a Key Safe or to learn how to set a Key Safe code here. The client is given the choice of either a Supra key safe at £40.00 or C500 Key Safe (police approved) at £60.00. The fitting is free. Every referral is assessed based on the vulnerability of the client and their needs. If we are unable to assist, we try our best to signpost the client to where assistance may be obtained. Despite much advertising, word of mouth remains the best way of spreading the news about this excellent service!